Here is a recording of the 1893 version of the Symphony, when the work included the ravishing Blumine movement (placed as the second movement). 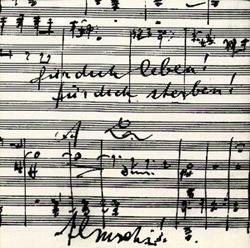 Unfinished at the time of Mahler’s death in 1911. The orchestra for the symphony cannot be defined precisely, owing to the incompleteness of the orchestral draft. However, in the short score there are occasional indications of instrumentation, and some of the orchestration may be surmised from the three movements of the orchestral draft, from which the probable forces include: four flutes, one piccolo, four oboes, four clarinets in B flat and A, with one doubling E flat, three bassoons, two contrabassoons, four horns, four trumpets, four trombones, a tuba, two sets of timpani, tam tam, a large muffled military drum, harp and strings (first and second violins, violas, cellos and double basses). The orchestration does not specify a cor anglais or a bass clarinet, although Mahler always used these instruments, so these should be included in the minimum forces required, as well as a modicum of extra percussion that he likewise regularly employed, for example, bass drum, cymbals, and triangle. Posted below is an historical recording of great interest, as it was problably the first time a large audience got to hear this unfinished symphony. This BBC broadcast was a revelation to me...as there are excerpts from the unfinished 10th played in the 'stand alone' state...the notes as written in the sketch-score before musicologist Deryck Cooke added any needed orchestration in his performing version. It really is a wonder to hear portions of the score 'as is'...very compelling and quite beautiful. There is no better way to be introduced to this symphony. A first, still incomplete performing version by Cooke (1959–1960) stemmed from a performance and an associated lecture for radio broadcast on the BBC Third Programme, marking the centenary of Mahler's birth. This aired on 19 December 1960, with the Philharmonia Orchestra conducted by Berthold Goldschmidt, who also assisted with the production of Cooke's edition. At its first performance Cooke's realisation of the final movement proved to be a revelation to listeners, and Cooke resolved to revise the orchestration of the Scherzo movements, which had required much more compositional work than he had time for. Alma Mahler, who had at one point taken the views of Bruno Walter to heart and demanded a veto on further performances of the Cooke performing version, actually changed her mind upon seeing Cooke's revised score and hearing the recording. In May 1963 she wrote Cooke a letter of encouragement, lifting the ban on both the performing version and the BBC recording. Where would Mahler's music have gone had he lived longer than fifty years? A body of opinion has maintained he would have explored the same general routes as his younger contemporaries Schoenberg, Berg and Webern. But Mahler was such an important figure to these men one wonders if their paths would have been quite the same if had Mahler lived. That he would have remained a Mahler that we would all have recognised from previous work there is I believe no doubt. Creative artists are always themselves in the end, they can't change. But that Mahler would have changed with each subsequent work he produced to the same degree he did in previous works is also surely not in doubt either. There are passages in what he left us of the Tenth Symphony that he was working on when he died in 1911 that indicate "new-out-of-old" paths which also fascinatingly seem to become born out in composers he did subsequently exert an influence over. Berg, Hindemith, Shostakovich and Britten spring to mind. Even though these composers would not have been aware of what the Tenth Symphony contained for much of their working lives. So the Tenth Symphony material left by Mahler is of crucial importance at the very least to our perception of where he was going after the Ninth Symphony and perhaps a little after that. Had Mahler lived longer it would also have been into a world that would have seen him witness immense social change. Had he survived into the late 1920s or early 1930s he would have come face to face with Nazism and who knows what effect that would have had on his music, let alone on his personal life. In the end, all speculation is futile and we must concentrate on what we have and know of his life and work as it exists. In the years when most of the Tenth Symphony material lay unheard any perception of it was incomplete. Nowadays with the material is before us in a number of forms we can reach our own impressions of this unfinished life's work. Of course, there was a time when opinions like the following were heard more often: "The author inclines to the view that precisely someone who senses the extraordinary scope of the conception of the Tenth ought to do without adaptations and performances. The case is similar with sketches of unfinished pictures by masters: anyone who understands them and can visualise how they might have been completed would prefer to file them away and contemplate them privately, rather than hang them all on the wall." Thus spake Theodor W. Adorno on Mahler's Tenth. I beg to differ. But those who are, like Adorno, against any attempts at producing "adaptations and performances" out of the material left by Mahler will not be interested in the recordings I am going to deal with here and need read no further. Those who believe the material should have been left alone, accessible only to a small coterie of scholars, would long ago have had the chance to make up their minds about this matter at the time of the first appearance of Deryck Cooke's first performing edition in 1964 after Mahler's widow had lifted her ban on performances. For years the posthumous torso of the Tenth Symphony had been in Alma Mahler's hands. Many had come to believe it was in too fragmentary a state to make anything presentable to the public, let alone whether such a project was the right thing to do at all. In the 1920s the already fully scored first movement, along with the likewise-scored Purgatorio third movement, were published and performed. But hearing these two movements out of context, as you still do sometimes today, is a mistake since little sense can be made of where they fit. As Deryck Cooke said, imagine hearing only the first and Adagietto movements of the Fifth and realise how little you know of what else is contained in that work. Schoenberg was given a look and even Shostakovich was approached but nothing came of this. Much later Alma Mahler would allow publication of a facsimile of the whole material and then the cat was really out of the bag. It became possible, if not inevitable, for a number of people to try their hands at creating a score that could be performed in concert alongside all the other works in the Mahler canon. The late musicologist Deryck Cooke was the best known to produce a performing edition of these sketches, but there have been others. Joe Wheeler in England, Clinton Carpenter and Remo Mazzetti in the USA are also represented in the discography by recordings of versions of the Tenth they have produced and I will come to their versions later. But it's a version by Cooke you will hear most in the concert hall and see in the CD catalogues. Cooke's that has become and will, I believe, remain the "benchmark" edition. In 1960 Deryck Cooke was on the staff at the BBC and preparing a booklet to accompany Mahler Centenary concerts in 1960. Believing that not dealing in detail with the whole of what was left of the Tenth would be to sell Mahler short, Cooke immersed himself in the facsimile. After a long process of work he produced first a radio feature containing a partial version of the work and then a complete performing edition that was premiered at the Royal Albert Hall in 1964. Mahler composed the work itself in four staves from start to finish with no gaps at all. We know enough of his working techniques at that point in his life to know that, once he had set down that stage of a work, he never altered the basic structure. He then orchestrated the first movement and, to most intents and purposes, the tiny third movement. Only the beginning of the second movement was orchestrated and then the orchestration runs out. However, through the rest of the four staves there are indications, some more detailed than others, of his thoughts regarding possible orchestration, dynamics and tempi. It's these that have been worked on to arrive at what could be reckoned eighty-or-so percent of Mahler's wishes at that time. Deryck Cooke always pointed out that after arriving at the stage this "performing edition" partially represents Mahler would inevitably have further revised the work again and again - the form especially rather than the substance - and it is in those revisions that Mahler's own refinements would have come in and his unique sound emerged, a unique sound no one else would have got to. So Cooke never offered his work as a "completion" of the Tenth rather a performing version of the score as it stood at the point Mahler had reached. So no version can be called a "completion" and it is very important to bear this in mind. Only Mahler would have been able to complete the work and we know from Mahler's lifelong working practice that it would have sounded different from all the various versions we have before us in a thousand ways. However, so long as we keep in our minds that what we have is a presentation of "work in progress" we ought to be able to keep a sense of perspective and gain a greater insight into Mahler's life and music than we would if we had rejected any realisation out of hand. As the American Mahler scholar Jack Diether put it: "It is much more important that what Mahler wrote should be heard than that which he did not write should not be heard." In this case, I prefer Diether's view to Adorno's. Cast in five movements the Tenth Symphony, even in the state it was left by Mahler, emerges with an extraordinary sense of structural balance. More so than that of the Ninth. Two Adagios frame two Scherzos, which themselves frame a strange, tiny, achingly descriptive intermezzo marked "Purgatorio" at the very centre. We walk with death-haunted nostalgia in the first movement. Then through rather forced happiness in the second movement. On to Purgatorial unease in the third and tragic bitterness in the Fourth movement. At last we arrive at a series of "death knell" drum strokes ushering in the remarkable last movement. Here the work's darker elements are reviewed and explored until terror from the first movement is recalled before serenity and heart's ease is won at last. Deryck Cooke had this to say about the work in general and why it is vitally important we consider it in the form it was left: "It shows clearly that Mahler, far from plunging further into preoccupation with death, was moving towards a more vitally creative attitude... there was still plenty of life in him when death claimed him... the Ninth Symphony had been a phase, like the Sixth, which he had faced and overcome." So the Tenth Symphony gives us a further chapter in the autobiographical "novel" in music that was Mahler' life's work. What is being mapped in this work is Mahler's own state of mind. Especially under the pressure in 1910 from his tempestuous marriage which, at that particular time, was under the greatest strain of its short life. Exclamations of his torments litter the score's pages. In the following posts, I will consider each movement along with the different musicological completions and compare. Each "completion" is a hypothesis how the symphony could sound...the different view points are fascinating, and don't sound that much different in the larger view, showing just how strong Mahler's conception remains. I've slowed down because school has gotten busy...hopefully soon I can post more on the 10th Symphony, and then it's on to the third!!! Leo, I was wondering, is it true that Mahler sometimes referred to his 9th symphony as his 10th, simply because so many other composers made it up to nine and then died? I think he was hoping to escape the same fate, but wasn't quite lucky that way. Virginia Dupuy, mezzo; Simon Sargon, piano. "...all the published songs of Alma Schindler, written before she married Mahler in 1902."